Tamir Blum ’16 is a mechanical engineering major who has thought about one day working with robots. Or maybe for a company whose focus is outer space. Either way, he’s got a little experience with both. 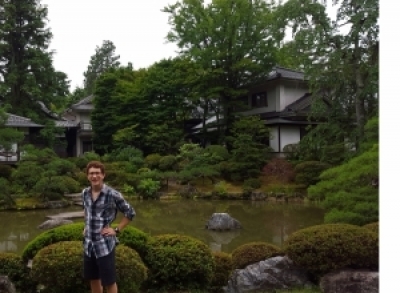 With the support of a Summer Undergraduate Research Fellowship (SURF) grant from UNH’s Hamel Center for Undergraduate Research, Blum spent 9 weeks at Tohoku University in Sendai, Japan, working with a team that is building a moon rover for the Google Lunar XPRIZE competition. That space challenge has groups from around the world vying to land a privately funded rover spacecraft on the moon, have it travel 1,640 feet (500 meters), take high-definition videos and images and transmit them back to Earth. The first to do so will receive $20 million dollars. Teams have been working on the project since the contest was announced in 2007. During his fellowship, Blum conducted robotics research with professor Kazuya Yoshida, a renowned Japanese roboticist from Tohoku University. The 15-member team included undergraduate, graduate and Ph. D. students from France, Brazil and Canada who researched and integrated software and hardware solutions for Team Hakuto’s rover system. “I wanted an experience where I could broaden my views on the world by learning about a unique culture while also conducting research that would help prepare me for graduate school as well as the robotics and space industry afterwards. This opportunity, which I am thankful for, allowed me to do both,” the Newington, New Hampshire, resident says. He spent much of his time working on processing, particularly on the watchdog timer, an electronic timer that automatically restarts the rover’s computer if a malfunction occurs. NASA’s space shuttle program ended in 2011. Blum hopes that private funding — and continued curiosity — will reignite interest in going back to the moon. Blum's research also was supported by a $3,500 Benjamin A. Gilman International Scholarship through the Office of National Fellowship. The Gilman Program aims to increase the number and diversity of students studying abroad. Learn more about Tamir Blum’s research and that of many other students who conducted research abroad this past summer at the International Undergraduate Research Symposium on Friday, Oct. 2, in MUB Theatres 1 & 2.